With it’s latest budget the government has made a number of moves to create a level playing field in the banking system. It’s taxing the five largest banks, announced a review of rules around data sharing, a new dispute resolution system for banks and other financial institutions, and new powers for the regulator to make bank executives accountable. All of this is on top of a Productivity Commission inquiry into the competition within the Australian financial system, announced this week. While some of these moves – such as the bank levy – will have a positive effect on making smaller banks more competitive, there are more policies that could be considered. These could include the separating out of the retail arms from the other areas of the large banks, increasing the capital requirements of larger banks to equal those of smaller banks, and developing new sources of funding for smaller banks. Investments Ombudsman and the Superannuation Complaints Tribunal. Called the Australian Financial Complaints Authority (AFCA), it will give consumers, businesses and investors a binding resolution process when dealing with financial services companies. The scheme will provide for a basis for more competition as disputes on financial services are consistently resolved regardless of the provider. And A$1.2 million has been given to fund a review of an open banking system in which customers can request banks to share their data, which could assist financial startups and other competitors enter the market and compete against the big four banks. Banks will likely be forced to provide standardised application programming interfaces (API) that enable financial technology companies to provide services for interested consumers. The government has also provided A$13.2 million to the Australian Competition and Consumer Commission (ACCC) to further scrutinise bank competition and to run the AFCA. This follows a House of Representatives report that called for an entity to make regular recommendations to improve competition and change the corporate culture of the financial industry. The ACCC will provide Treasury with ongoing advise on how to boost competition in the sector. This may include a reduction of cost advantages of big banks, barriers to entry for new firms including change costs for consumers. All of these changes come after a decade of consolidation and upheaval in the financial system, which has hurt competition and increased risk. 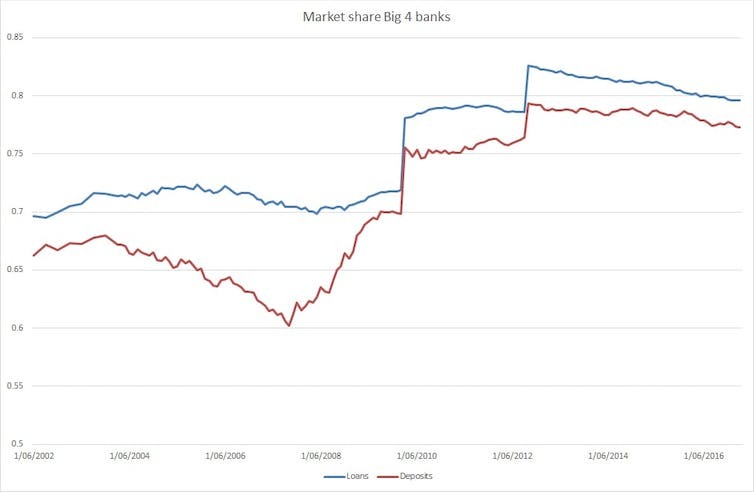 Market share Big 4 banks. As you can see, since 2002 their market share has grown from 69.7% to 79.6% for loans and from 66.3% to 77.3% for deposits. Also, the gap between market dominance in loans versus deposits has closed since the global finance crisis. This means the big banks are attracting a greater share of bank deposits, which has an impact on the smaller banks. With limited access to deposits, which is a relatively cheap way of raising capital, smaller banks have had to rely on the more expensive wholesale debt markets. Small banks also have difficulties to tap other funding sources such as covered bonds. This makes their products less competitive, and they have struggled as a result. In part, that’s because a number of banks disappeared or merged with the big banks after the global financial crisis. This includes St George, Bankwest, Bendigo Bank, Aussie Home Loans, Adelaide Bank, RAMS and Wizard. The Murray Inquiry found the big four banks have less than half the capital set aside for emergencies than some smaller financial institutions do. Again, this makes the smaller banks less competitive and needs to be addressed. The government should increase the capital requirements of larger banks to close the cost advantage for larger banks. In addition, rising house prices have led to a further increase in the concentration of mortgage and other housing loans in the Australian banking system. Today Australian banks have about twice as many mortgages on their books as in the next highest developed economy. New financial startups, such as peer-to-peer lenders, have entered the banking system. In time they may rival the big banks in areas like personal lending, but they remain small in terms of market share. And the big banks’ unwillingness to share data may be a hindrance. The concentration in the banking sector does not provide the best outcome to all Australians. It has led to a low range and low quality of financial services as well as high costs. This needed to be addressed. The new banking levy will support competition, as it pushes up the cost for the big banks. The review into data sharing could also be a boon to financial startups and other competitors, although we don’t yet know what the outcome will be. But even stronger government actions may needed to create a level playing field. The government should consider separating out of the retail arms, from the other areas, of the large banks. Failing that, the low capital buffers of the big banks need to be addressed.